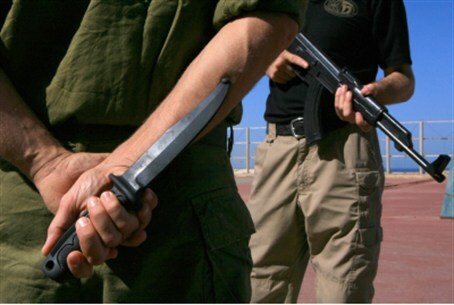 MainAll NewsDefense/SecurityJerusalem Stabbing, Road Terror Mean 3rd Intifada? Jerusalem Stabbing, Road Terror Mean 3rd Intifada? As mortar fire “spills over” into the Golan Heights from Syria, and Gaza terrorists attack the south, PA Arabs strike with road terror. As mortar fire accidentally “spills over” into the Golan Heights from the Syrian civil war, and Gaza terrorists attack southern Israel with rocket and mortar fire, Palestinian Authority Arabs in central Israel move ahead with road terror operations. As terror attacks against Israelis intensify both in frequency, as well as variety, ferocity and geographical spread, it is worth considering whether the phenomenon heralds the possible advent of a third intifada, as many military analysts have warned. This, on the eve of a declaration by Palestinian Authority (PA) Chairman Mahmoud Abbas that he will make a second attempt via the Palestine Liberation Organization (PLO) to gain observer status -- just one step removed from full membership status -- at the United Nations General Assembly. A Palestinian Authority Arab terrorist attacked a Jewish woman Sunday afternoon in the Jerusalem neighborhood of French Hill. The attacker struck as the 30-year-old woman who sat in her car near the fence of a school waiting with her two young children for her husband while he was in the school. He yanked open the car door, brandishing a knife and stabbed the young mother in the face. It is believed he was trying to hijack the car. Magen David Adom paramedics were called immediately to the scene and rushed the woman to Hadassah Mount Scopus Medical Center in Jerusalem. Police officers fanned out to search for the attacker, after he fled the scene. PA Arabs also attacked Israeli motorists as they drove Sunday by the Jewish village of Negohot in the Hevron Hills, according to YeshaNews. In what has become known as road terror attacks, the Arabs were hurling rocks at cars as they drove close to the village. One of the cars sustained several direct hits and was damaged in the attack, but the driver and passengers were not physically injured. Such attacks are intended to kill by causing the driver to lose control of the vehicle. The car then crashes or slows down enough to allow attackers to attack their victims directly. On September 28, 2000, Ariel Sharon -- then a Likud party candidate for Prime Minister -- made a heavily-guarded visit to the Temple Mount despite concrete terror threats to his safety. On that day, he stated bluntly, "The Temple Mount is in our hands and will remain in our hands. It is the holiest site in Judaism and it is the right of every Jew to visit the Temple Mount". Palestinian Authority Arabs have since claimed that act was a provocation and see it as having ignited the "Second Intifada"; however others say it is not so simple. Many analysts have said that then-Palestine Liberation Organization Chairman Yasser Arafat had pre-planned the terror onslaught as a means of deflecting criticism over his failure to successfully win concessions at talks earlier in the year at Camp David. In a speech made in December 2000 by Imad Falouji, the PA Communications Minister at the time, Falouji explained that the violence had been planned since Arafat's return from the Camp David Summit in July, far in advance of Sharon's visit. He stated that the "Intifada" was "carefully planned since the return of (Palestinian Authority Chairman) Yasser Arafat from Camp David negotiations after he had rejected the U.S. conditions (for a final status agreement with Israel). Sharon's visit was used as an excuse for Muslim clerics to incite their followers to an unrestrained and unprecedented bloody campaign of terrorism that lasted from that day through 2005, and took the lives of 1,000 innocent Israelis. Also known as the Al-Aqsa Intifada, and as the Oslo War, it was a period of intensified Arab violence, which began in late September 2000 and ended around 2005. A 2003 study conducted by Israel's International Institute for Counter-Terrorism (ICT) concluded that PA Arab fatalities have consisted of more combatants than noncombatants. Up to 2005, the ICT puts Israeli combatant casualties at 22% and civilian at 78%.